You know that saying "never mix business with pleasure", well it ought to be engraved on my HEAD! Seriously. A few years ago (back when I was working) I had a bonus and nothing particular to do with it. With hindsight I should have spent it on an expensive holiday or any number of things, but what did I do with it? I blew it on my bathroom. When we moved into our flat everything was PERFECT, except I did not like the bathroom and I did not like our bedroom. The rest was perfect; what they call a turn-key property. Anyhow, I just so happened to be spending a lot of time with my best friend. We'd been best friends since Uni, she was my Chief Bridesmaid. During that period we were having quality time she was pregnant. That fortnight we saw each other more than we normally see each other in a year and I discovered that her husband had given up I.T. to go into DIY. We literally went to the Vitality Show (the ultimate girl's day out) to see Joseph at the theatre (set me back 52 GBP) and numerous other things. Anyhow they could tell I was thinking of cancelling, so they changed the price to mate's rates. That night two things happened. One, I put the ball in my husband's court as I knew he would say no (it was still too pricey and I knew it). He threw me, as he said "it's your decision!" and two, I worked out (it was easy for me to do as I have done Payroll for years) that all they had done was taken off his self assessment tax contribution and the VAT, and the proof of it, they'd asked for cash. I said yes, for two reasons. One, I am stupid. So very stupid and two, as he now had that week booked for me, I was thinking that if I pulled out he might not replace that week of work and my friend was about a fortnight from giving birth. The irony of that comes later. So with a great deal of trepidation I proceeded. I was at home with him while he worked and he was a dream come true. Every night he took away his tools, neatly stacked materials, and hoovered and swept. Yes he really did. One day he broke a dustpan and brush and was distraught, to which I said "it was only 99p!" But, several things started to unravel. One, we'd always known that the roll top bath I had chosen was about 2cm too long for where it would be going. My friend and he had both said it could be chisselled into the wall, but when he did so, he made a HOLE in the wall. He finished the job and went home and NEVER raised it with me. Not only did he not flag it, he didn't even show it to me. In fact he did one better and hid it, but very badly. At a later date we had to spend a couple of hundred pounds on that. I could not at all understand how anyone who could feel bad about breaking a dustpan and brush could just walk away from making a hole in the wall - the chisselling that should have simply made room for the bath had gone through to the kitchen! I bought a VERY expensive chrome ladder radiator. The sleeves for where it meets the floor/wall are also chrome. In the Bath Store catalogue you had to specify if you wanted floor or wall ones. During the time that the bathroom was back to breeze blocks (he gutted it) I asked him and he said "it doesn't matter". I knew it did (I was a DIY Manager in Homebase for 2.5 years back in the day) but despite being gobby I did not say anything (oh so so so many regrets)! You'll see a horrible pic later of the unnecessary copper piping he had to use as a direct result of his doing this wrong! The reason it did not matter to him is that he did not make the chrome flush with the floor. He bent copper piping to bridge the gap. That is NOT how it looks in the catalogue. Worse still he made huge holes. Oh you couldn't make it up. The amount of things he did wrong quite frankly did (and still do) broke my heart! Suffice to say I never spoke to my best friend again but that was not the right way to handle it. What you do is, you retain at least 15% of the money (I paid him in full stupidly) and you refuse to pay it until snagging is done. He didn't do one item of snagging. You know that saying "saved by the bell" well his last couple of days she'd given birth so he did a couple of half days to finish the job and rushed off. He never walked or talked me through his work as a result so I never got chance to say "LOOK at that!" A few months later she had the gall to ask for staff discount at the place I worked. I said "yes if he comes round and puts up the bathroom cabinet as promised". We'd spent 90 pounds on one and he'd never hung it and we don't own a drill (I know I know I know)! Anyway it gets curiouser and curiouser as he did come round but one, when I answered the door he had his motor bike helmet on, and two when he came in, you could tell he did not want to speak. I am REALLY sensitive to vibes so I stayed in the sitting room watching some reality TV show (can't remember what as it was some years ago now) and just answered any questions we had. There were no social graces or familiarity and gobby me did not take the opportunity to say mate look at this this this and this. It's just not the me I am now. I still have issues with confrontation BUT my gut instinct is SO good now, that that night when I was thinking of cancelling, instead of putting the ball in my husband's court I would have done. Also, we've had to spend money over the years (out of the mouth of MY son)on fixing things as a result of his work, when one of the reasons I didn't cancel was because SHE was about to give birth. You know what, I think he confessed to her that he did a TERRIBLE job as I took lots of "before" photos and I had promised them "after" ones for his website and yet neither of them ever asked for them, plus she never asked me why I was no longer in communication (at all) with her. The only contact to this day has been that one time she asked for staff discount. That's the other thing. She is THE tightest person that I know. If you knew you charged someone 2,500 (just for labour) and that didn't even include the separate toilet (just the bathroom) or the materials, you wouldn't have the gall to ask them for staff discount, when that was your only contact with them. Yes I got something in return, deliberately; the bathroom cabinet was hung. But guess what?!?!?! He could not even get THAT right. A couple of years later, because it was quite full, my husband noticed a gap on one side between the cabinet and the roof of it, so he took it off the wall in case it ever landed on us, or 300 pounds worth of wash-hand basin! You will NOT believe what we discovered underneath. So yes, he did not even do THAT right. So like I said before, for the radiator pipes he made huge holes (see below), and then just filled them, when anyone in the trade would make the holes the right size, but also, he did that with all of the holes that went to outside but did not fill them in any way so one year our bathroom was full of wasps who were coming in from outside! 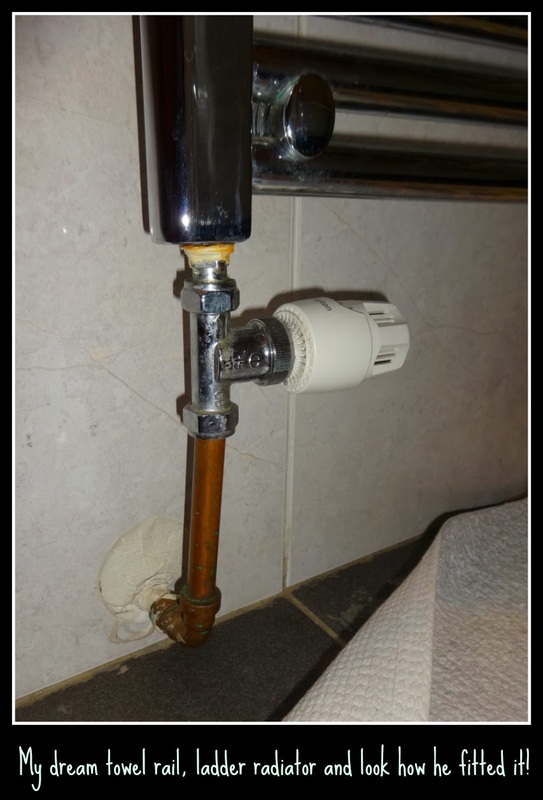 That copper piping should not be visible. The chrome sleeve should be flush with wall or floor, which is why both are available, and he has it bent too, so every year it leaks! Well maybe not every year but we do have to have it tweaked now and again at a cost! The one on the left and the one on the right are not even at the same height so are bent, i.e. not in line with the radiator itself. That valve on there was originally a gorgeous chrome snazzy one, but one of many tradesmen who have looked at it changed it - yeah even that made me sad! There are two more things that upset me. One, the way he fitted the electric shower. I thought it was an issue where he did not cut the tiles around it neatly enough. 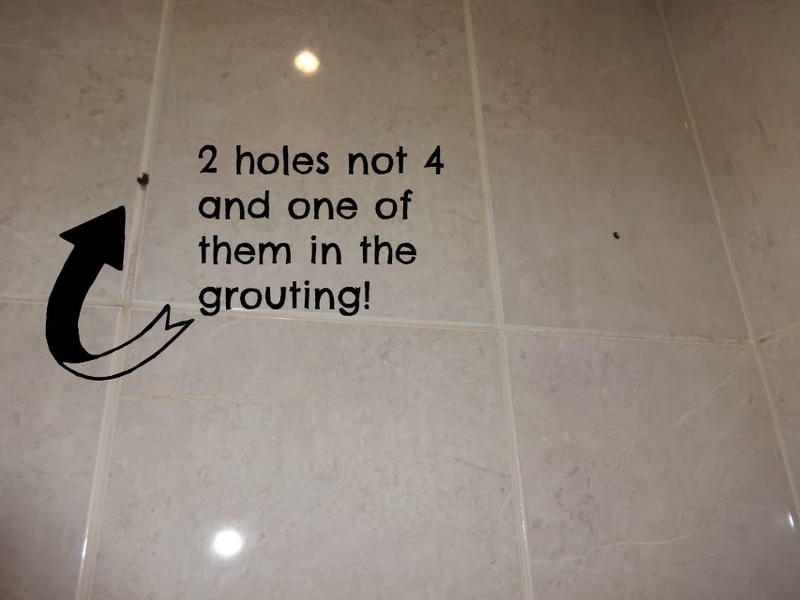 However any tradesman who has looked at it over the years has said that no, what he should have done is taken the shower off the wall, drilled holes in the tiles for the water feed to come through and then put the back of the shower back on the wall, i.e. the shower is hanging on the wall, with just holes for the cold and hot feed. Instead he cut the tiles VERY badly around the shower unit! I would show you a photo of THAT but I have some pride - dear God! I hope karma bites his backside! The second thing: he started tiling from the door, so was left with two areas of slivers in two corners. Any tradesman who has looked at THAT has said what you do is you pick your focal point (the corner you see when you walk in) and you work out left and right with full tiles from there. Basically he did not know what he was doing at all. When I paid him for materials through some Google basket thing it asked me to give him a review and I deliberately did not bother and he did not remind me. Like I said above, they did not ask for the "after" photos either. The bathroom in total, including his fee and all materials was 4,900 in total. For that, I should have had hotel standard. But alas no! If you run your had across the tiles they are not even level. I had dreams of candles and wine in the bath. Long baths used to be my thing. I got ALL top notch stuff. All of it was Bath Store. All of it expensive, and it was literally wasted because nothing looks great if the "finish" is not satisfactory. So to this day, I am so broken hearted about it, my bathroom cabinet is on the bedroom floor and my toiletries are in Soap and Glory (xmas) bags (those big ones) instead of on the wall. When I am in the bathroom I can't wait to get out of there. 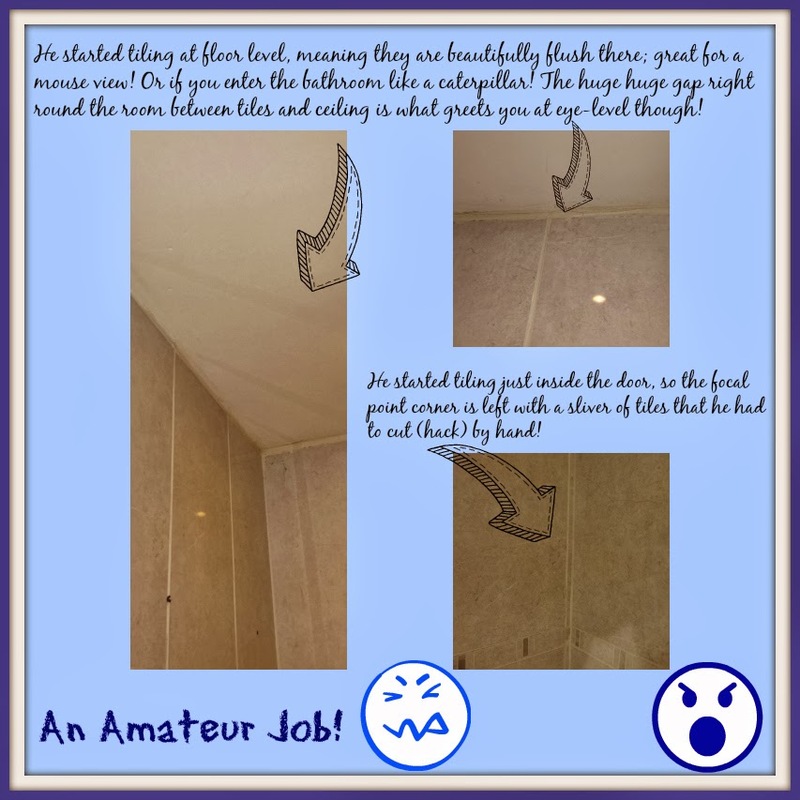 If you are more confident at DIY than me, if you also have a bathroom disaster, then this is what I have now found: The Ultimate DIY Bathroom Guide. The only good thing that happened since my bathroom disaster was that at one point my bathroom taps broke and I took to this blog and Twitter and got the taps replaced and installed free of charge by the manufacturer (sending their own plumber over to me). A manufacturer who is so ironically called Crosswater! Yes I was indeed cross about my (lack of) water! The blog post alone would not have worked, but Twitter ramped it up sufficiently and they clearly wanted me to go away. Speaking to customer service and managers was to ill effect till I took to social media. Several times over the years the radiator leaks, due to how he hung it. Anyone who looks at it just cannot understand it, as he was back to breeze blocks so he had no reason to cut corners. He just plain and simply was not a professional. I would love to look here: for bathroom inspiration, but I literally just cannot face it anymore. If you however are untarnished by bathroom trauma it is a great website - I did have a little play. I can see me just walking out the door one day, and leaving it for the next person to deal with. That is not me, not me at all, but it quite literally broke my heart, broke a friendship and broke my bonus/bank balance. I always knew my friend was tight but she really outdid her self with this one! Have you ever been ripped off by a friend? or had a DIY disaster? Are you still with me, still reading? I have never written a post this long in my life! I'd love to include before and after photos to show that the items I chose (tiles included) are way nicer than what we inherited from the previous owners, but the before photos are on my other computer! Plus, it'd rub it in that they are not shown off to good effect, with such a piss poor finish! The radiator was very expensive, so the way he has hung that just makes me desperately miserable each and every time I look at it. Doesn't help that the bathroom is the first thing you see when you come in the door. Oh Liska, I have so many of these stories when I went against my initial instincts. Why don't we learn and have more confidence in our own intelligence? One day you'll have a new bathroom and you'll not get a DIY guy to install it. We've been ripped off by family....My fellas brother used to be our landlord and had us paying for repairs which he should of paid for....Always said he would give us the money back and never has....Grrr!! Oh my goodness! What an awful experience and so sad to lose a friend too. My bathroom, which has just been completed (you can see it on my blog) was fitted by a friend of a friend. It is IMMACULATE. Everything is perfectly fitted and he charged us less than average for labour.We have all Bath Store stuff too - and it does look like a hotel bathroom! I'm so pleased with it. Oh my you were truly turned over, stitched up like a kipper and any other of those that I can't think of at the mo. My hubbie is landscape gardener and also does extensions etc and I know he would find that shocking - yup always go with your gut and I hope one day you'll have the bathroom you dreamed off.